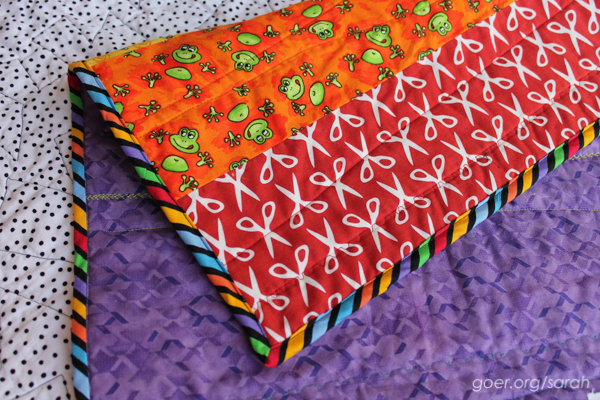 Your son is turning into a typical quilter.... Making for someone else to show how much you care for them. 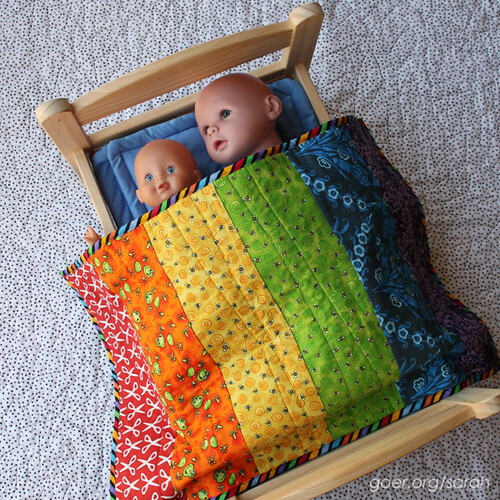 Love the rainbow theme and the beautiful quilting. Happy birthday to your daughter! Thank you, Lorna. He's turning into a typical quilting in more way than one. While accompanying me on a local shop hop this month and to our recent guild meeting, he's picked up a handful of fabrics to build his stash. Awe...that's so sweet that he made that for her. And congrats to him for a second finish and one he designed himself. That is a big big deal! 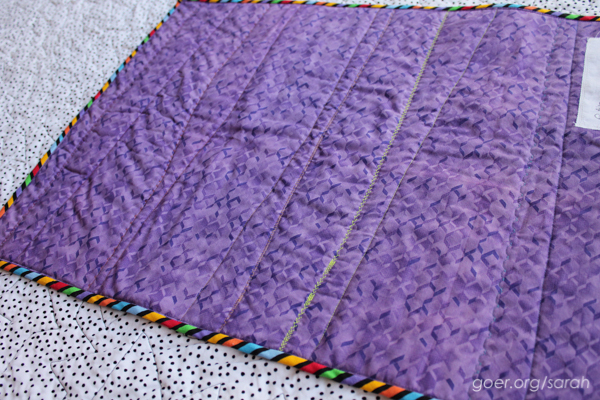 I wish I had introduced my daughter to quilting when she was younger. Thank you, Tish. It's so great to see how proud he is of his work. Oh, how sweet of him! What a lovely big brother! Thank you, Eleanor. His plan is to make a quilt for Dad next. That is so awesome! Does he know what he wants to work on next? That is just about the sweetest most wonderful gift for a brother to give a sister! 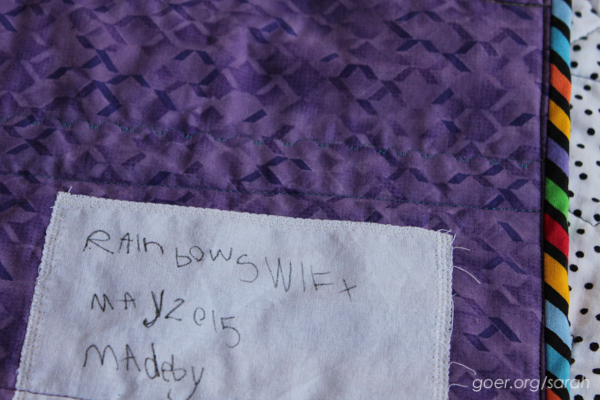 He did a great job choosing the fabrics and all the sewing is just right! What a treasure! Get 'um while they are young. Love it! 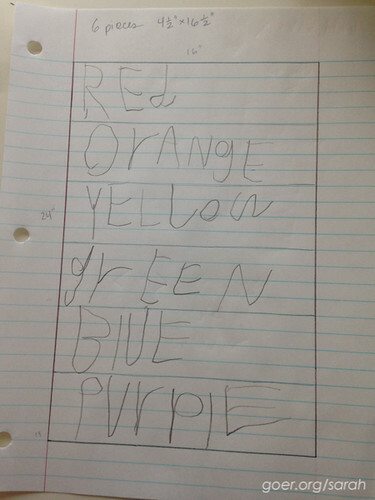 This is the sweetest little sister gift I have ever seen. What a treasure. Sweet big brother! Nice job! What a sweet and thoughtful gift...and he made it...fantabulous!! It really is a beautiful quilt!! Way to go, kiddo!! What a special way to share what you love with your son. The quilt is precious too! Thank you, Sherry. I'm really glad he's enjoying it. He's very proud of his projects. Very nice finish for your son, I am sure that your daughter will enjoy it. How adorable! What a great way to show his love for his sister. Thank you, Vicki. I'll be sharing everyone's comments with him. Please tell your son that the lady from the quilt show saw the pictures and LOVES the quilt he made for his sister! 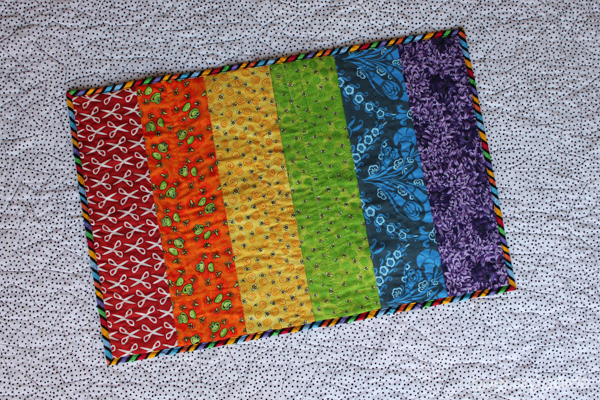 It's colorful, just the right size and the quilting is very fun. Great job!! The quilt is amazing ... how old is your son? Also, I noticed that the pins are "capped." What are they called and where can I find them? I'm thinking of doing a workshop for younger Girl Scouts and they would make my life much easier! Thank you, Donna. He turns 5 this month. He'd done some hand sewing at school and started machine sewing and quilting at 4.5. Those are Pinmoors. You can find them on Leah Day's website: http://www.leahday.com/shop/product/pinmoors/ I use the pins she recommends with them and they work very well! And so great for machine quilting. Super easy to remove! Have fun with your Girl Scouts. What age are you working with? Thank you for the information. I will definitely check it out. We are going to do a Quilts of Valor project that involves the entire Service Unit ... I am the Service Unit Manager and we have approximately 86 troops, ranging in age from 5 to 18. I was (and still am) having a hard time trying to figure out a way to incorporate our littlest Daisies (ages 5 & 6), but seeing your son and his completed quilt gives me renewed hope! How fabulous! Its so cool that you're teaching your son to quilt. Thanks, Adrianne. Yesterday was his 5th birthday party and he kept retrieving the two quilts he's made to show people. It was so cute. It's fun to see him so proud of his work. So cute, and the story behind it is even cuter! Great job to you both! 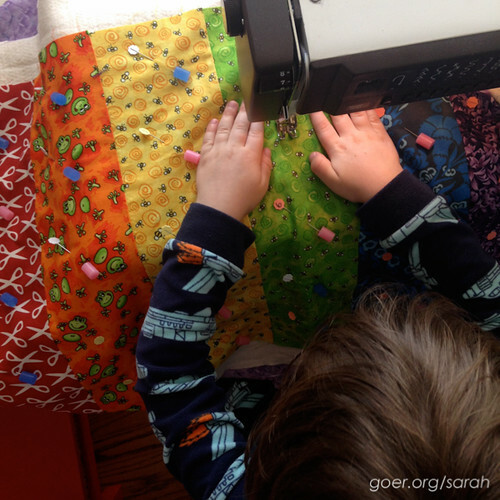 And your adventures in teaching your son to quilt has me hopeful for when my son, not quite 2, is just a bit older. 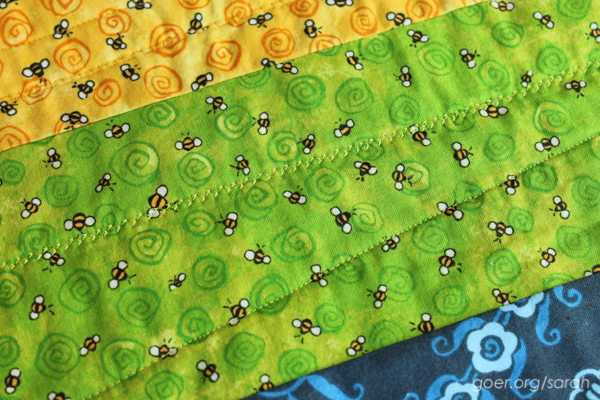 I love those little baby hands quilting. Great point-of-view on that shot, Sarah. Thanks, Johanna. I should put together a scrapbook of all his sewing pictures.